"A unique experience - spotting and stalking huge trout in amazing surroundings. The service and guiding was the best." 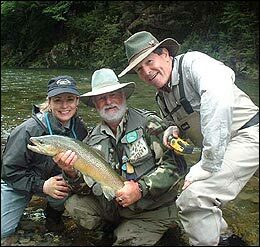 "Best guided fishing we ever had, anywhere." "Chappie made our South Island guiding trip fantastic, breathtaking scenery, amazing trout and the service was out of this world." Chappie wants to hear from you! Please take the time to let Chappie know what you liked about this Web Site, or what other information you would like to see on this site. Help Chappie to have an exciting and informative web site which will be updated on a regular basis.